MANCHESTER - The unpredictable fight for the White House went national on Wednesday, as candidates fanned out across the United States and Democrat Barack Obama bounced back from a surprise loss to Hillary Clinton to grab a coveted union endorsement. Clinton's narrow upset of Obama in New Hampshire on Tuesday set up a tough and possibly lengthy Democratic nominating battle that heads to Nevada and South Carolina and on to February 5 "Super Tuesday" contests in 22 states. 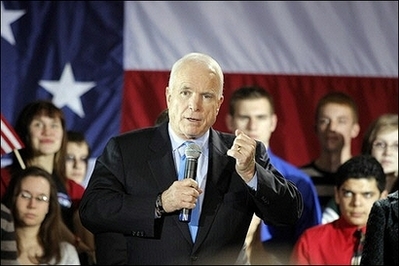 Republican John McCain, meanwhile, soared into the next Republican battleground of Michigan with fresh momentum from his New Hampshire win, hoping to score a knockout punch on Tuesday on rival Mitt Romney. The state-by-state race to pick candidates for the November election to succeed President George W. Bush shifted from the intimate, face-to-face politics of Iowa and New Hampshire to a wider national campaign driven by big-money television ads and cross-country plane trips. Obama won the backing of the Culinary Workers Union in Nevada, a major force in a state that holds the next Democratic contest on January 19. The union's 60,000 members, many of them Hispanic, service the famed hotels and casinos on the Las Vegas strip. He spent the day in New York and Boston raising money and held a rally in New Jersey, where an overflow crowd of more than 3,000 packed in a college gymnasium. "My voice is a little hoarse, my eyes are a little bleary, my back is a little sore, but my spirit is strong," Obama told cheering supporters. The loss in New Hampshire "reminds us that change is always met by resistance from the status quo," he said, echoing a line aimed at Clinton by rival John Edwards in a debate on Saturday. Clinton, a New York senator and former first lady, returned to Washington during the day and had no public events. Terry McAuliffe, her national campaign chairman, said her New Hampshire win spurred a rush of more than $1 million in donations in one day and pumped up the candidate and her supporters. "It was a big, big win for this campaign. I cannot tell you how excited we are as we move forward," he said. The 71-year-old McCain's political rebirth also gave his once-struggling campaign new life and put him in the midst of a wild scramble for the Republican nomination that has so far produced no clear favorite. "This state can again play a key role. We won here in 2000 and we will win again in 2008," McCain, whose presidential bid collapsed in 2000 shortly after his Michigan win, told an airport rally in Grand Rapids.